" I just do music because it keeps me alive." So if you follow my blog regularly, you may know that I have been to South Korea in September. 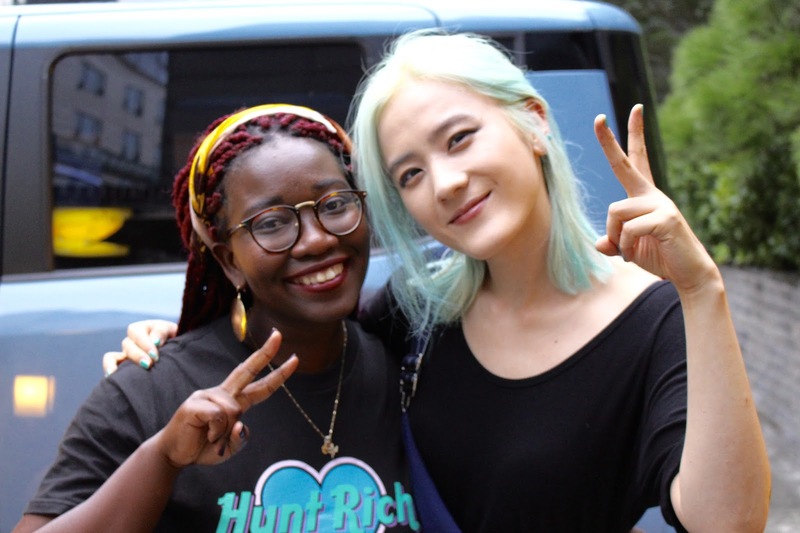 During my stay in Seoul, I was granted the opportunity to meet up with Echae Kang, violinist, songwriter-singer, and one of the members of the rising Korean indie duet Echae en Route. My interview with her has deeply impacted me and I was truly happy to be able to encounter the beautiful soul and talented artist that she is. I have been late but I finally managed to do the whole transcript of our interview, as I could not sum up the whole thing without omitting keys elements. The overall interview is quite long but is VERY interesting. So get yourself a good cup of tea and read it through. 1) Icebreaking: Who is Echae (spell it e- ché)? - Echae: I am a violinist and a songwriter. My name is Echae Kang. I started to play violin when I was 5 years old because my mom was a classical guitar player and she wanted me to become a “super” classic violinist so I had all the education for about 15 years. - Me: So you studied solfeggio and other classical music courses like that? - Echae: Yeah! I was classically trained for a long long time but I was wanted to play something different like French gipsy music or something that is not usually played by violinists. Back then, nobody really considered playing those kind of music. They were only playing classical instruments. And I didn’t know how to explore my instrument with different styles... But one day I found Stéphane Grappelli. He also had a classical violin tone but he was playing something that I had never heard and it sounded good so I started to realize that I could do something else with my violin that is not only classical music. So I started to dig up on internet and I saw so many jazz violinists in the US. So I look into Berklee College of Music because one of Stéphane Grappelli’s good partners was teaching there. So after a very long time, I succeed in convincing my mom to let me audition for Berklee College of Music. So I succeeded to get in and that where the whole thing started! I never knew that I was going to sing. But I met so many friends who were singing because they love music and they didn’t really care about being a good singer or not. They just really saw the singing as part of their music. So I became less afraid to do things that were not natural to me and I started to play in different jazz or pop musical group, doing musical sessions with them and that’s basically how I was making money after graduating from school. I was never like the leader of the group or anything. Just part of the band, playing violin, that’s all. I worked in the US during 3 years and moved to different cities. But I really didn’t like to play in bands as a session player because a lot of time I had to deal with stuffs I didn’t want to: managing tours, business enquiries, etc… So I just got tired of it and I decided to come back to Korea. Basically stay in my room and playing violin because that’s all I wanted to do after working a few years. So I came back to Korea which I never expected to do and all I was doing after coming back was practicing violin for 7/8 hours a day. - Echae: Yeah! I was so happy to do that. And then I figure out so many weird things that were happening. I started to upload my music on Facebook and people were loving it! And first I thought people just thought I was funny or that I had weird skills or something. But I actually realized that it could be serious! 2) Talking about Echae en Route genesis, music creation process and being a non-idol musician in Korea. - Echae : So… I started to look for a bassist but first I had a drummer who introduce me to my current musical partner OhKyung. We used to be a trio but there was a show where they didn’t have drums so we couldn’t have a drummer. So we started to rehearse just the two of us and it wasn’t so bad and actually we worked very well together and people actually like it more during this show. Also, the drummer we had, was really young and he had to go on military service! So we decided to stay on this bass/violin dynamic and we thought about making an album. The album came out and people like it a lot. So we got more shows and here we are now. I want to state here that I madly in love with their album! Echae en route, their indie duo is definitely the most amazing musical discovery I’ve made this year so far. - Me: So he is in a different management from Echae? - Janett (Echae’s manager): Yeah, he is signed to another management company and Echae is signed to my company, Private Curve. - Me: So, how do you handle these management issues? - Janett: Actually, we cannot handle them and in terms of profit sharing and stuff, we have a lot of difficulty to share the profits between the two management company. If you want to make a booking for Echae en Route, you have to call someone obviously but who do they call? Private Curve or OhKyung’s company? You know, it is almost a political thing so upon to recently, any Echae en Route shows were booked through Facebook and stuff and it was really tiring. So right now, we just kind of stopped things and I am going solo right now. - Me (horrified face): so you guys will stop doing Echae en route? - Echae: For the moment, we are just going to do our own stuff (Echae is going solo and OhKyung will continue his activities with The Solutions). But, we have actually won a competition organized by CJ Entertainment (ndrl: one of the biggest music companies in South Korea) so they are going to support us to release Echae en Route's second studio album. It will be released in the beginning of next year. - Me: You said that you have been studying music since a very young age, have you always have a true passion for music or were you only doing it because of family pressure? - Echae: When I was younger, I didn’t like it. It was part of my daily practice or my mom would yell at me. I had to do it for 15 years. I had to compete with all my orchestra friends and it was really stressful. But after I started playing my own music, it became passion for me. Nobody was pressuring me anymore. I just did it because I like it. - Me: How would you describe your music? - Echae: I always get this question but I don’t know how to explain it. As a genre, I would say, it is jazz-pop…. In my solo album, I have tunes that are very pop and some are very jazzy. I just don’t put walls to my music. I just play what I feel like. - Me: You said you were a songwriter, what are your main sources of inspirations? - Echae: I think my inspirations would be the musicians I have been listening to since a long time: Emily King for instance. Inspiration also comes from my own experiences: people I met, the things I have gone through. When I have something to express, I usually do it through my violin and start creating tunes. - Me: So the music actually comes to you first, even before the lyrics? - Echae: Well, the melody comes first and then the lyrics come along. Often, It is when I am drunk (laughs). It is the only moments when I can sit down for 5 or 6 hours and write, moments when I get emotional. - Me: For Night Drive (my favourite song of the duo), how was the music creation process? - Me: So is Night Drive about break-ups and how you move on from the sadness it can cause us sometimes? - Echae: It is about… How do you describe this? You know when you decide to move on a new chapter without your ex-lover and you have a lot of thoughts but you don’t know how to tell them, and you don’t know if you are right or wrong… It is about the mixed feelings I was going through at this time. - Me: Before living in the US, have you always lived in Seoul? - Echae: Well, actually I am from Jinju which is 4 hours from Seoul in bus. So since middle school, I had to came in bus every day to Seoul after school, for my violin practice and then go back home. - Me (utterly choked): how did you manage that at such a young age? - Echae: I don’t know. When I think of those times, I couldn’t imagine how hard it was for a little child. But that’s the only thing I had to do in my life. My mom didn’t pressure me into being good at school but I had to take violin practise every day. Learning how to play violin was the only thing that I had to do in my life. I didn’t have any choice. I only had to do what my mom and my teachers told me to do. One day, I even took 10 hours of bus because I had to go back home because I had class the next morning in Jinju. But those times spent in buses and transports was the only moments I could listen to the music I like because my mom didn’t want me to listen to anything except classical pieces because my (violin) teacher told her I had a very “strange” rhythm in the way I played violin. So I had to tame that and make it disappear. So in the bus, I would listen to jazz and the music that I liked the most. I had an MP3 player that I managed to buy with money gift from aunts or my grandmothers. My mom found it and threw it away because she didn’t want me to listen to those pieces. But it was the same for my other friends too. We all had this very strict education and we were raised to be the best and to stay in the orchestra. - Me: But how do you manage real friendships in this climate of high competition between you and your orchestra friends? - Echae: We were friends though... I think because all our moms knew each other, we were all related in a way by music and our parents who knew each other. However, it was hard though because we all had to be jealous of the others. For instance, when a friend won a prize you were also competing for. We were kind of frenemies... (laughs) I don’t talk to any of those girls now. I don’t even care about knowing what they have become. - Me: You must have been very strong mentally to go through that! - Me: And you never thought about rebelling against this constant pressure? - Echae: I didn’t even know it was possible to do so. I just thought everybody were living like that, honestly. My teachers, my orchestra friends… I just thought that it was the only possible option. - Me: So when you came back from the US to settle in Seoul, how your feelings about Seoul evolved? Did you still hate it or did you eventually learn to love it? 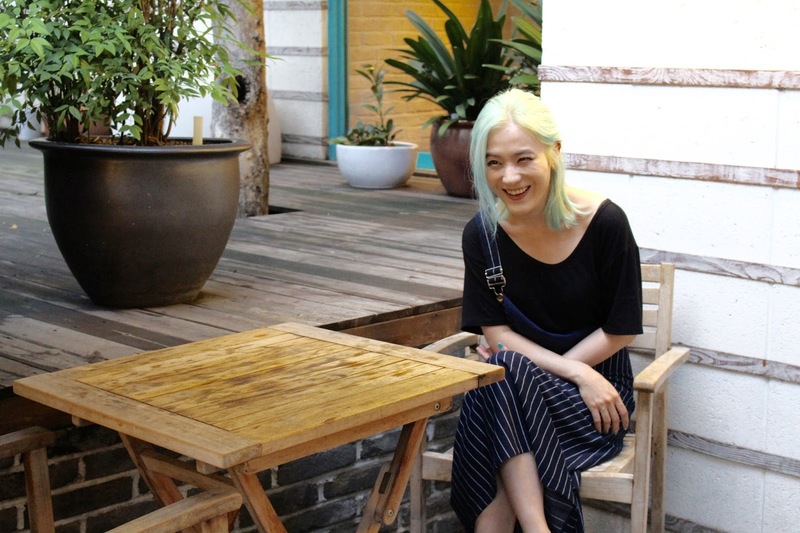 - Echae: When I came back to Seoul I was an adult and I also had many connections in the city, other Korean musicians that I studied with in Berklee College of Music and who were performing around. So all I wanted to do was drinking and practising haha! So I spent a lot of time with those musicians and Hongdae is a really great place for music; it is very artsy, very music-friendly and a good nightlife. So I would just bring my violin along when I was out and I would jam with friends until early morning and go for another drink again. I were also able to meet with educated musicians that were not very familiar with my style, so they were very interested in me in this way. - Me: I heard how hard it is for Korean indie groups to gain recognition. Your success came quite fast after your first EP and single album. How do you manage fame and it repercussions? - Echae: At first, I didn’t want to be famous or rich. I just wanted to play so my main goal was to book gigs. I really like gigs because even if it is essentially small venues, people who come are very attentive to the music and I like to play for this kind of public. I was with OhKyung at that time. We were getting more fans so that’s when we realised that it could be serious. And that’s when the complicated stuffs emerge like marketing, publishing, etc… So we realize we couldn’t play in small venues anymore with this kind of functioning. We actually had to sell tickets and that’s when all the fun stops haha. - Janett (Echae’s manager): It is actually hard to be an indie musician in Korea right now. Hyukoh for instance gains recognition after participating to a TV show and then they signed with a music company that gives them the exposure and books concerts and events for them. Echae didn’t actually sing until she came to Korea. - Me: Usually, when you say Korean music to foreign people, they would immediately say “K-pop”. Kpop has become such a huge industry now with millions of fans in the world, not only Korea or Asia, what are your views on K-pop? - Echae: I am always careful when I talked about K-pop because the music I liked when I was young was very far from K-pop. I listened to jazz or American pop. Of course, I would sing K-pop with friends in karaoke but K-pop was not priority. There are groups that influenced me a lot but I wouldn’t really consider them as part of K-pop like The Roller Coaster. It is not really about Korean music. It is more between Japanese and American music. K-pop these days, to me at least, is more of an entertainment than about music really. K-pop isn’t bad but there is a lot of good musicians out there and people just don’t care but they would go crazy the minute you talk about K-pop. I just wish the gap between idols and regular musicians were smaller but right now the gap is like Heaven and Hell. Some jazz musicians don’t even make enough money to live and a lot of idols make millions of dollars from their different activities. And I am not sure the quality of the music is that different. Both K-pop and Indie music are great. So the financial gap between idols and indie musicians doesn’t make sense to me. At the end of the day, it is a matter of freedom. I was expecting to be poor anyway, because of the choice I made to play music that I like and not music that would make you earn tons of money. My mom’s opinion was different, she wanted me to become a famous violinist and make a lot of money. But the problem is that when you start to make a lot of money and have less freedom, you can get the wrong idea about what being a musician is. I saw a lot of kids change with fame and forget what being musician were. And I really don’t wish that for myself. A lot of musicians that I admire manage to stay true to themselves while becoming well-known progressively and I want to be like that. I don’t want the music to become a secondary thing for me. As the musician, you just want to stay focused on your music. - Me: So what are your plans for the future? - Echae: It is hard to book concerts actually for Echae en Route abroad because of the co-management issue. And we had to give up a lot of good opportunities this year. - Me: What about Echae’s solo album promotion? - Janett: So she has a concert in November here in Seoul and also a performance as a violinist at the end of this year. - Me: Okay! That’s great. Are you planning to make some gigs or concerts in Europe? France for instance? - Janett: She actually came to Europe. She was invited to play in a music festival, in a historical town in Italy. - Me: You should come to Paris next time! 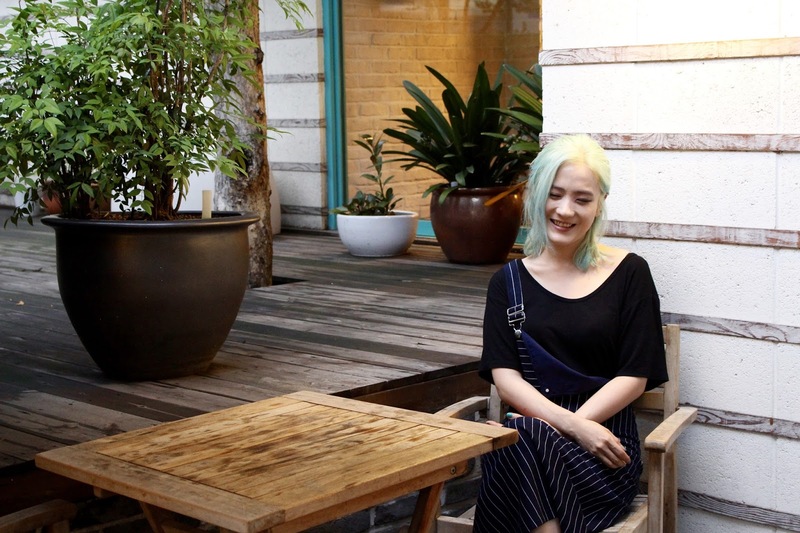 - Echae: I have already come to Paris but as a tourist not as a performer. I even recorded a music video in my hotel room there. I really loved Paris. I went to visit the touristic spots like the Arc de Triomphe. So many people there haha ! And my French host were very nice too. This is the 3rd and last section of this interview with some silly/funny/philosophical questions I wanted to ask Echae before ending the interview. She was so kind to play along with me. - Me: Could you give 3 of the songs/artists that have impacted you until today and that you often go back to? - Echae: Sergueï Rachmaninov, Chocolate by 1975, Georgia by Emily King. - Me: If you were an animal? - Me: What an ordinary day in Echae’s life looks like? - Echae: I don’t have life right now (laughs). I am always in the studio doing music. I don’t have any hobbies (laughs). - Janett: Actually Echae and I were friends from the US so when I started to work for Private Curve, I recommended Echae and she was signed. - Echae: And they were actually my dream company because one of my favorite singers is signed with this company. - Janett: Our company CEO is really into jazz music. So for instance, we organize the biggest jazz festival in Seoul with big names and 5000 to 6000 visitors a day. And we recently started artist management and our company style is really not aggressive or oppressive. We really let our artists express their creativity and do what they really feel like. - Echae: So when I learned that she was working for Private Curve, I asked if they were not looking for new artist to manage and the rest is history. - Me: This would be my last question for you. As I told you in my email, my project is to make portraits of artists around the world, through my interview with them. So what is your definition of an artist? - Echae (after a long moment of reflexion): I think Art, which is music for me, is the only thing that makes me live. Without it, I would be probably dead right now. I can’t do anything else. Nothing gives me hope about tomorrow except music. I don’t do music for others, because I have been through very tough times myself and I don't think I can take care of other people's feelings. I just do music because it keeps me alive. 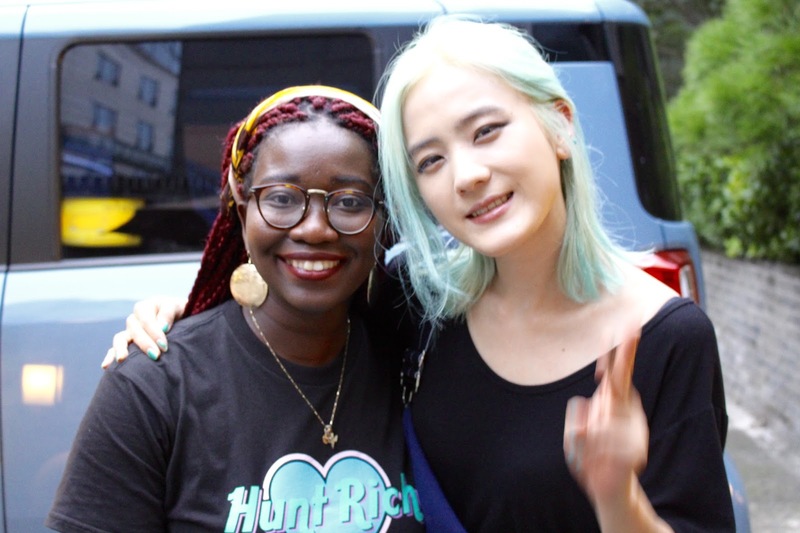 What an awesome ITW, thank you for that, it's quite hard to find an interview of Echae in english. Thank you darling, I know right ?!!! I am still so surprised that she agreed to meet me. Definitely one of my best memories of South Korea. I am glad you took the time to read it and that you liked it. She is definitely going to blow in the coming years.